Submersed plants are generally rooted at the bottom and are completely underwater. 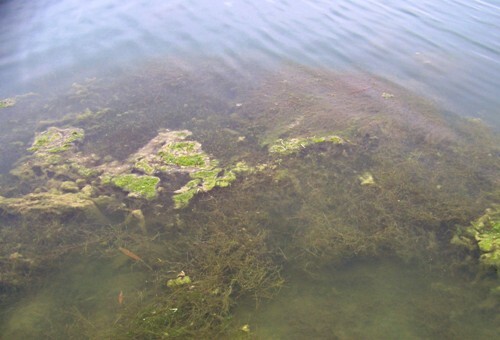 Submersed weeds are usually flacid and lack rigid cellular tissue. If any flowers are present, the may extend above the water surface. Bushy Pondweed: May be confused with Chara or Coontail. 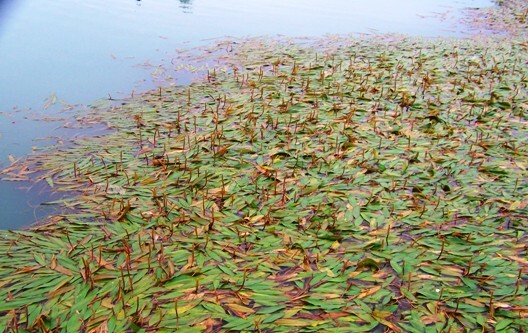 Unlike Chara, Bushy Pondweed does not have a musky odor when crushed. Leaves are narrow with tiny spines along the edges. Stems are slender with frequent branches. Leaves are densely concentrated at tips, with leaves oppositely attached or in groups of two or more at a node. American Pondweed: American pondweed is a perennial plant that has both floating and a few submerged leaves in an alternate pattern. The floating leaves are elliptical to oval 4 to 7 inches long and to 1 inche wide on long petioles. Submerged leaves are not abundant and are blade-like, somewhat transparent and smaller than floating leaves. Cabomba: (Also known as Fanwort) is multi-branched submerged perennial plant except for a few small (1/2 – 1 1/4 inches long) alternately arranged elongated floating leaves. The submerged leaves are opposite, attached by a single petiole, but above the petiole form a finely divided “fan-shaped” leaf. Fanwort has a small (1/2 to 3/4 inch diameter) white to pink flower which arises from the tip of the stem and stands slightly above the waters surface. Coontail: Coontail has leaves with a serrated appearance. Spacing between leave whorls varies, with the whorls being crowded at tip. Branches fork repeatedly. Can be confused with Bushy Pondweed or Chara. Unlike Chara, Coontail does not have a musky odor when crushed. Eurasian Watermilfoil: Eurasian watermilfoil is a perennial plant native to Europe, Asia, and Africa and was probably brought to the U.S. as an aquarium plant. Today it is considered one of the most aggressive and problematic plants in the U.S. because of the dense colonies which it forms. The stems are multi-branched, somewhat reddish in color, with gray-greenish feather-like leaves. The leaves are in whorls of 3 to 5 around the stem with each leaf divided into 12 or more pairs of thin thread-like leaflets. Reddish flowers are borne on leafless spikes that rise above the surface a few inches. Eurasian watermilfoil can spread from seeds or by fragmentation. 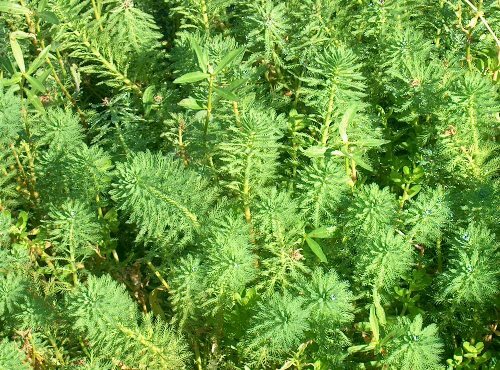 Hydrilla: Hydrilla is a perennial plant that forms dense colonies and can grow to the surface in water over 20 feet deep. 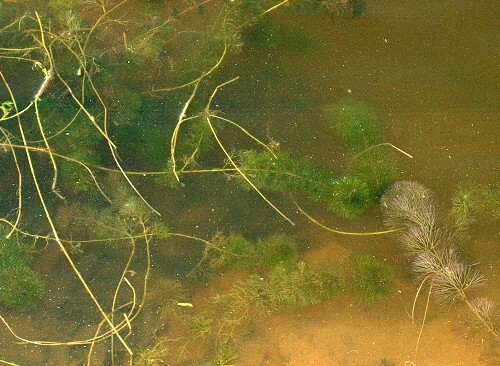 Hydrilla branches profusely and after reaching the surface it extends across it forming thick mats. Hydrilla can reproduce by fragmentation, from seeds, from turions (axilary buds), and from tubers. Leaves are blade-like about 1/8 inch and 3/8 inch long with small tooth margins and spines on the underside of the midrib which make them feel rough. Leaves are usually 4 to 8 in a whorl. Hydrilla is native to Europe and Asia and was probably brought to the U.S. for the aquarium industry. It is considered a noxious pest because it grows so rapidly, out competing and eliminating native species, and forming surface mats that hinder recreation, navigation, and water intakes. 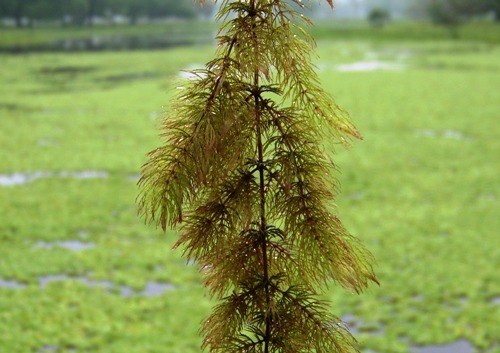 Hydrilla is often confused with the native Elodea or the non-native Egeria. Hydrilla has one or more teeth on the underside of the midrib, neither Elodea nor Egeria have these midrib teeth. 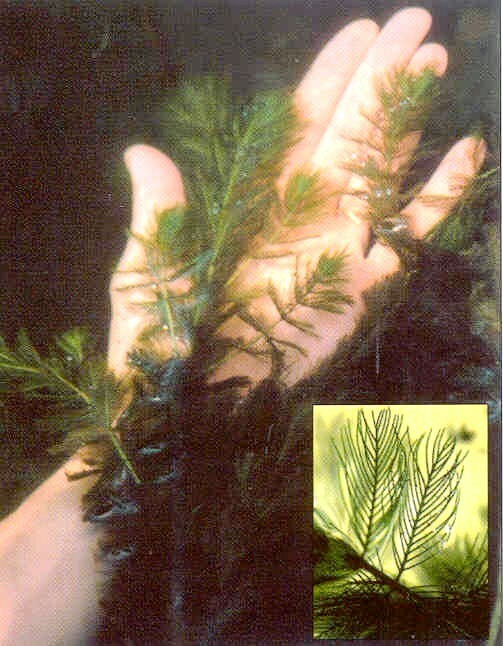 The teeth make Hydrilla feel rough when drawn through your hand from base to tip. Flowers of Hydrilla are much smaller (1/4 inch in diameter) than Egeria. Parrotfeather: Parrotfeather is a native of South America and was probably brought to the U.S. for the aquarium industry. It is a rooted, submerged perennial plant that usually grows in shallow water. 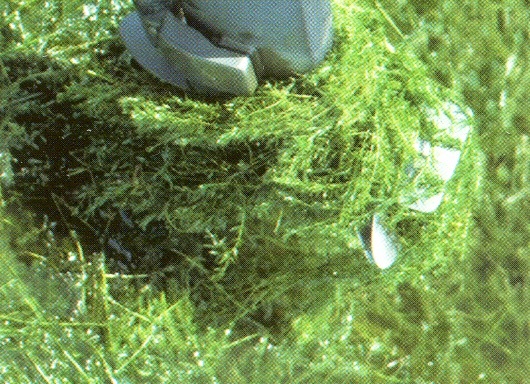 Parrotfeather gets it name from the gray-green thickly bunched leaves that rise above the water. These exposed leaves are whorled and have frilly divisions that give it a feather-like appearance. Underwater leaves are similar but less dense. The stems are relatively stiff. This plant is not native to North America but has naturalized in much of the United States. While it is not illegal to possess this plant in Texas it probably should not be introduced into new water bodies.